Coffee jump starts your day and keeps you alert and focused. But how many times have you been on a roll with pumping out new ideas or making mental notes of things to do, only to forget all about them once your caffeine kick wears off? Don’t let it happen again – get a Memo Mug! 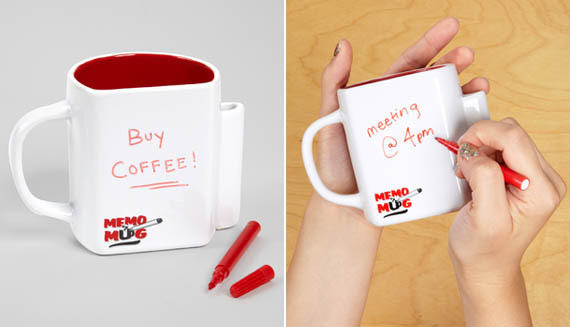 This ceramic mug that doubles as a message board features an integrated pen holder and measures about 4″ tall. Keep this on your desk (filled with java, of course) and carry on like the true genius you are.